Their costumes are made from traditional Welsh flannel in a variety of colours and patterns with, of course the famous tall Welsh hat which they actually only wear for one dance, called Llanover Reel. 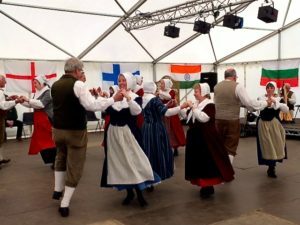 In the past Gwerinwyr Gwent competed in several Eisteddfodau, but now dance just for pleasure, taking part in festivals and demonstrations in Wales, England and Europe. The 17th CAERLEON FESTIVAL Fri 5th – Sun 14th July.